Even sat on the trailer at the boat ramp, there’s a touch of American swagger to the 190 Horizon. From its sleek, stylish lines down to the eye-catching mag wheels, it screams “I’m no ordinary bowrider.” Greg Adams reports. "People are first attracted to this boat because it looks good," says Peter Carlson, owner of Family Boats, and agent for US-based manufacturer Four Winns. "It’s an excellent build quality and finish. But once they have a go they find it also handles well in most conditions and is really easy to drive. It’s a good combination." There’s nothing quite like it, that’s true. This is the new 2007 model; so new, in fact, this was its first time in our waters (or any water for that matter). If you’re keen on wakeboarding or skiing, no doubt you’ll have noticed the gleaming tower straight away – and one of our intentions was to check out the 190’s towing performance. We weren’t disappointed but more on that later. The structure itself is optional but probably a given since the primary purpose of a boat like this is for enjoying water sports. It also comes with a Bimini canopy for shade (although it wasn’t fitted for our review). Normally factory-fitted, this particular tower came courtesy of Auckland company X-AIR – and definitely adds to the imposing look. Having undergone a major revamp last year, changes to this particular incarnation of the 190 are few and fairly subtle. The most obvious is the new, metal-spoked steering wheel, which looks very cool. Elsewhere, the carpet’s a little darker, the dash has a different background, the stripes and graphics on the hull have changed, as have those on the upholstery. Otherwise, it’s business as usual. Four Winns has been building boats for more than 30 years and, it’s safe to say, prides itself on the high quality of the 8,000 or so craft it makes every year. As its literature proudly boasts, they produce "interiors that make others feel inferior". It’s a catchy turn of phrase, of course, but one that certainly seems to have some truth about it. Step on board and you’ll immediately find a lay-out that’s contemporary, stylish and comfortable. Fittings are stainless steel throughout, including pop-up cleats and handholds. The handholds at the bow are integrated into the upper edge of the gunnels, continuing the stylish look. The windscreen is glass and, unusually, the high grade carpet is both rubber backed and removable (a nice touch should you need it out of the way for more messy pursuits like fishing). The dash has elegant Faria non-fogging gauges, each with shrouds to shield instruments from the glare of the sun. There’s an AM/FM radio with CD player, iPod port and speakers. The seat and backrests are all made of Aquaflex, a vinyl made exclusively for Four Winns. It’s highly resistant to scuffing and abrasion, and has a strong backing to resist tearing and cracking. Unlike many other craft of comparable size, the 190 offers flexibility in the seat configuration. As standard, the boat has a bucket seat at the helm, with a back-to-back for the passenger – that folds out into a sun lounger – and two jump seats at the stern, either side of the engine. These can be used as seats, mounted low, or flipped over to provide a non-skid step over the transom to the swim platform. Alternatively, it’s possible to have two bucket seats at the front, and a rear bench seat – a set up known as the Sunsport layout. The engine cover also has some innovative thinking behind it. There’s a hatch built into the top that provides easy access for routine checks of the engine oil, belts, and so on. But if you need to remove the whole engine cover, it only takes the release of two thumb screws mounted at the deck. There’s plenty of storage, too – including those all important cup holders seemingly everywhere. Between the main seats is a good-sized floor locker with room for skis and other toys. The screen easily opens in the middle to reach the bow, where the two side seats lift on hinges, which makes them not only secure but also easy to access the space beneath. The small forward seat covers the anchor well – made-to-measure for a Danforth, with a six metre chain. Back at the stern, there’s a swim platform and a rather nifty fold-out boarding ladder – its clever design means you can climb out at a gentle angle as opposed to straight up. The boat we tested also comes with a tandem-braked trailer, with folding draw bar and mag wheels, as well as road and bow cover – and all for, well, it’s not cheap but you do get a lot for your $63,000. The 190 Horizon measures 5.64 metres (18’6") overall, with a 2.41 metre (7’11") beam and a 0.79 metre (2’7") draft. The hull is fibreglass with foam, making it light but stiff and strong, and capable of dampening vibrations. Two engine options are available – Volvo and Mercruiser. Ours was fitted with a Volvo 4.3L 225HP (80 per cent of Four Winns boats have Volvos), complete with new stern leg, SX-A. If you feel you don’t need all that power, you can save yourself $10K if you opt for a 4.3L 190HP engine, with a single axle trailer. This Horizon 190 had an impressive power to weight ratio, which meant we certainly enjoyed our afternoon trip out. Top speed is 55mph, cruising is 30mph, and it manages 15-25mph towing speeds comfortably. But an impressive punch isn’t all it offers wakeboarders and skiers. A quick look astern and, like our expert wakeboarder James Donald, you’ll be pleased to be left trailing in the 190’s wake. The 21-year-old, who has represented New Zealand at Under 18 and 21 levels, described it as "real nice". "These types of boat can leave frothy finish to the water but this has a flat platform and a good peak," said the engineering student. "It’s also steeper at the top, which skiers love as it throws them up – more air, more time." We’ll take that as a definite thumbs up. The engine is petrol and provides economy comparable to much smaller capacities. "Over a 10-hour period, it’ll use 12 to 13 litres an hour," says Carlson. "It’s as cheap as a 150HP outboard." How does the boat fare on water? One of the first things that’s noticeable is the 190’s stability. The company’s patented Stable-Vee hull – a deep V hull (19-21 degree) that’s wide on the chine – offers a "large, stable footprint". In other words, it’s got pretty darn good lateral stability whether resting or moving. In fact, at rest, with two people port or starboard, boat list is barely noticeable. Overall, the boat handled well and the power steering means "it’s like driving a car". As for colour, blue and black are the most popular choices, but there are a variety of hues to choose from. This is Family Boats’ fourth season with Four Winns. Covering the upper half of the North Island, it has some boats in stock and brings them in to order. "It’s proving a popular boat," says Carlson. 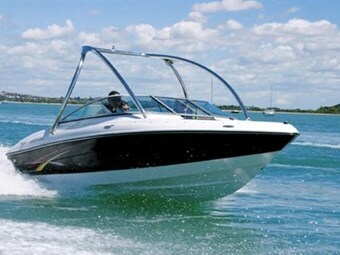 "It’s a general, fun family boat, suitable for all sorts – diving, fishing, and especially water skiing and wakeboarding. We’re seeing more and more towers being requested." And that’s hardly surprising. Despite its high spec, classy feel, there’s no doubt the 190 Horizon is a willing workhorse that will more than meet the demands of most ‘on water’ pursuits. It has ample space for fishing – two people can easily stand in the front, for example. And, as was ably demonstrated to us, there’s an imposing combination of power, control and design that makes for some excellent skiing and wakeboarding.